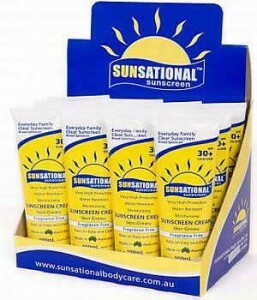 SUNSATIONAL SPF 30+ Clear Sunscreen Cream provides very high protection from UVB rays that cause sunburn and the deeper penetrating UVA rays that cause premature aging and skin cancer. Australian made Sunsational sunscreen contains moisturiser and anti-ageing ingredients such as antioxidants that look after the skin, and is registered with the “THERAPEUTIC GOODS ADMINISTRATION” of Australia, and is priced competitively so people are encouraged to use everyday. Sunsational is owned and run by Sunsational body care at http://www.sunsationalbodycare.com.au , located in Sydney, with distributors in Peru and the United Arab Emirates.